Graduates Saki Maruyama and Daniel Coppen have designed a set of children's toys that encourage "free and open-ended play". Called Knotty, the collection features three inputs, a push button, shake sensor and sound sensor, which can be connected by a "special rope" to one of three outputs – a motor, LED light, and a buzzer. The project aims to help children develop their creativity by encouraging experimentation and playfulness. Knotty features three inputs with orange loops and three outputs with teal loops. These are connected to one another using a "special rope" that is tied to any two components to create an electric current – for example, the shake sensor can activate a buzzer. With Knotty, the Royal College of Art graduates wanted to make a tool for children that enables them to apply technology as a means to explore and create, in a similar way to traditional, analogue toys. "Despite the rise in tech-toys over the last few years, there's not many which apply technology in a way that promotes free-play in the same flexible and open-ended way that simple building blocks or LEGO does," Maruyama told Dezeen. "Play is a free, explorative and iterative process to discover new meaning and is an important element for innovation," said Maruyama, who studied a masters in Innovation Design Engineering. "It is through unstructured, free and open-ended play that children can develop their own creativity and interests." The pieces are also designed to combine with other materials. "Stick paper on it, use velcro straps to join it to bottles, or attach it to your wrist to make it wearable!," she said. Although the emphasis of Knotty is on playfulness, the designers believe the motion of triggering outputs from inputs can also teach children the basic principles of coding. "We believe that by simply playing and creating with Knotty, kids will naturally pick up the logic behind it," she explained. "By applying the intuitive interaction of knot-tying, Knotty is the easiest, quickest and most open-ended way for kids to pick up and create with technology. As a result, Knotty provides more and more opportunities for children to engage in the free-play they need for healthy development." 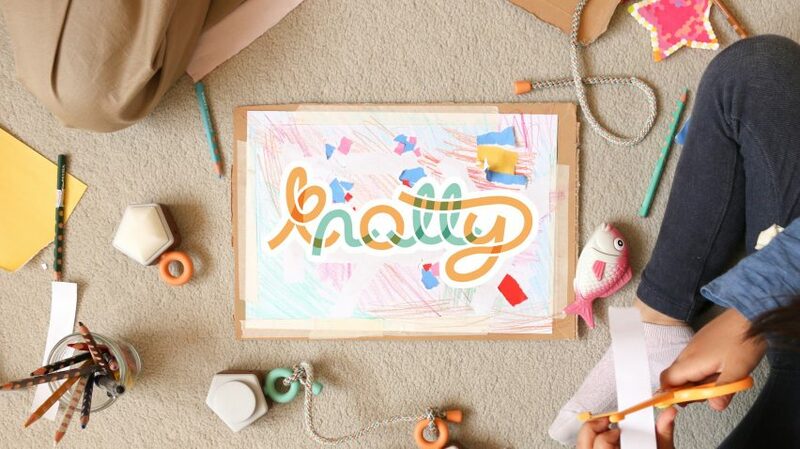 Knotty is designed as an alternative to screen-based toys. "Today's kids are receiving a lot more screen-time watching TV or playing games on tablet devices, another factor filling up the opportunities for free-play," she continued. "Most applications of technology is often in the form of screen-time or STEM toys which heavily focus on teaching educational principles such as coding. These give kids an opportunity to play but only in the form of structured exercises and tasks." Knotty was on show at the Royal College of Art as part of their annual degree show. Other graduate projects include a series of brass tools that aim to encourage muscle memory to help train dancers and a portable cooking set for kitchenless millennials.